Please note we will transport a drop bag from start to finish. Clearly, mark your name on your bag. This service is provided to those who take the shuttle or who get dropped off. Starting at the Mega’s Cafe (Gold & Main Street) in the historic town of Foresthill, the 50km runners will follow the North Fork of the American River on the Tevis Cup and Western States trails before crossing No Hands Bridge, and finishing in Auburn at the American River Canyon Overlook Park (Auburn Dam Overlook). Highlights include following old mining roads and trails along the river, holding onto a cable as you wade the river at the historic Poverty Bar crossing used for decades by horse riders, passing the ruins of the Mountain Quarries. crossing the famous No Hands Bridge, and passing Robie Point on the way to the finish at the American River Canyon Overlook in Auburn. 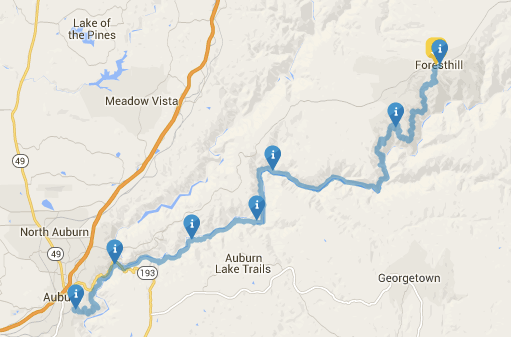 All races finish at the American River Canyon Overlook Park (Auburn Dam Overlook) 855 Pacific Avenue, Auburn, CA. Finish line closes at 6 pm. Participants have 10 hours time limit to complete 5ok. Heading east on I-80 take the Auburn Folsom Road/Maple Street exit toward Auburn, turn left on High Street, turn right on Pleasant Avenue, then slight left on Pacific Avenue. The park will be on the left. Heading west on I-80 take the CA-193 E/CA-49 exit toward Placerville, turn left on Lincoln Way, turn right on Oakwood Drive, turn left on High Street, turn left on Pleasant Avenue, then slight left on Pacific Avenue. The park will be on the left. Course Maps and altitude profile. * Please not Poverty Bar (mile 19.4) will be a river crossing only. 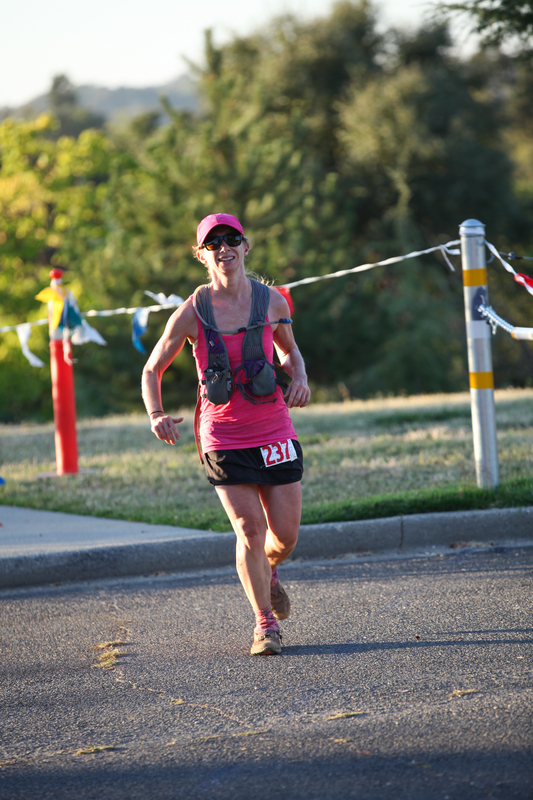 Static rope and volunteers will be provided assist runners across American River. No aid will be provided at Poverty Bar. Carry enough water to cover 8.4 miles from Rucky Chucky to Brown’s Bar aid-stations.